Ever heard of Morocco's liquid gold???????????? 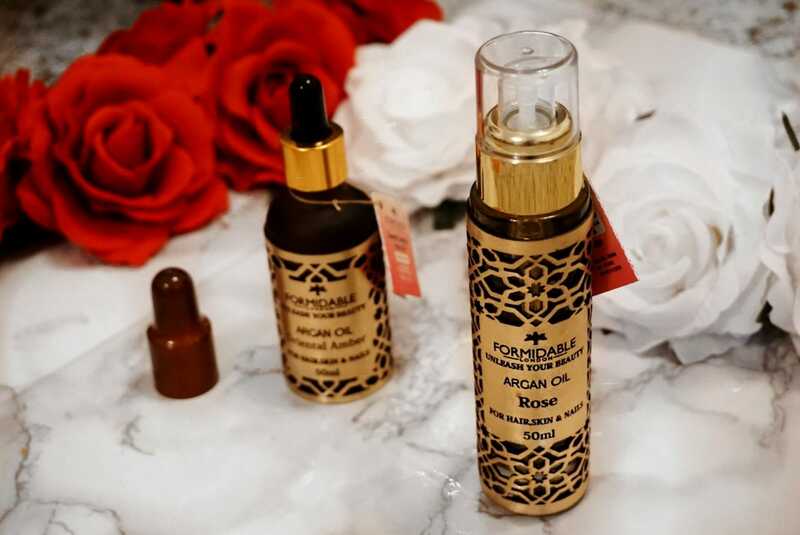 I am extremely excited to bring to light for the second time the exclusive Argan oils from Formidable London . We are not talking about your average class Argan oils but rather of a brand that uses the highest quality Argan oils known worldwide. Their Argan oil is extracted naturally free of chemicals in the Sous valley in the south of Morocco. Remember that when you use high quality Argan oil you will reap all the benefits of using a natural product. All their Argan oils are 100% Organic. The problem with the mass worldwide market is that most companies try to reduce production costs by diluting their Argan oil. When you buy cheaper Argan oil you will unfortunately be exposed to ingredients that will affect the oil itself. 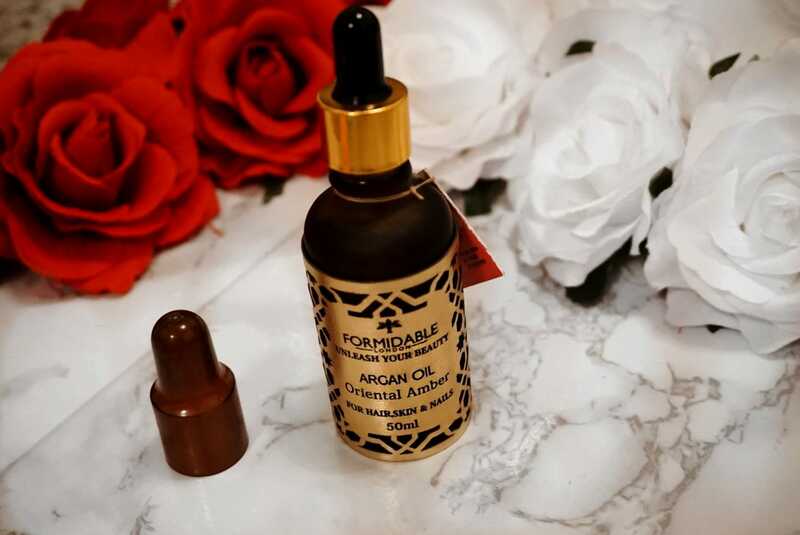 Formidable London ONLY uses natural Argan oil!!!!!!!!!!!!!!! This is KEY when buying your Argan oil. 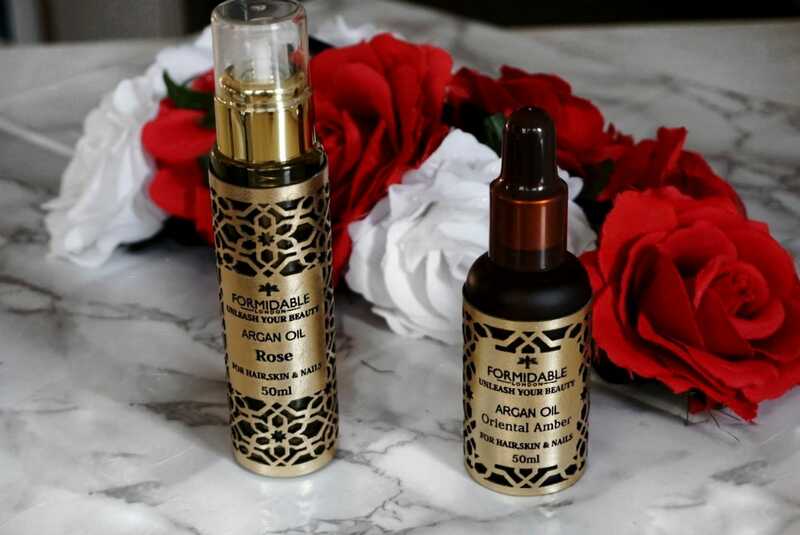 Formidable London has developed two further scents of Argan oils : Rose Argan Oil and Oriental Amber Argan Oil. I can't explain how much I adore their oils. They hold so many uses that are key to effective hair care, nail care and skin care. BOTH men and women can use the Argan oils for all hair, nails and skin needs. The Argan oil not only acts as a skin moisturiser but also is known to be effective in those who have acne or rosacea. You are probably wondering how can an oil be effective on oily skin? Simple, this is mainly because of it's unique property of being lightweight and non-greasy. It has the power of being absorbed extremely quickly by the skin. This allows pores not to be clogged. Formidable London's Argan oil excels in keeping ALL types of skin hydrated and restored. The Argan oil has anti-aging and skin repairing properties. The skin and the Argan oil work in symbiosis by both protecting the skin barrier by free radicals in the air and by helping the skin in retaining much of it's natural moisture. Argan oils are used to help hair with moisture and also against split ends. I find that the oils are excellent for keeping nail cuticles moisturised. 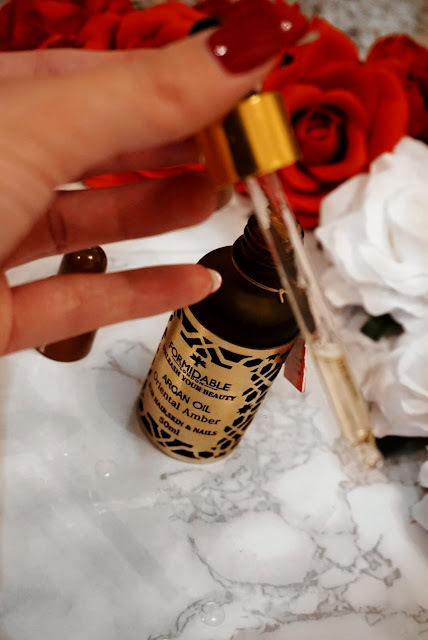 Let me give you some details about my two favourite oils which are now part of my everyday routine. Their packaging always screams luxury! I am a sucker to high quality packaging. I love how they have gone with a faux gold leather wrapped around a dark amber matte glass bottle! If you have read my post about Formidable London before you will know that the dark bottle is a must for Argan oil as the oil must be kept away from light and heat to keep all their properties. 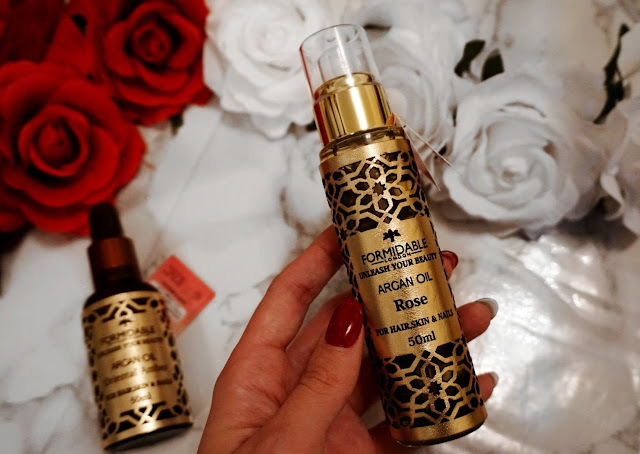 You are provided with 50ml of premium luxury Argan Oil infused with Rose essence. The Rose Argan oil as per all their products is rich in nutrients for your hair, nails and skin. What I particularly love about the Rose scent within it , is that it's not overbearing. I have never liked Rose scents, but in this particular brand I can only describe it as a SEDUCTIVE ROSE scent. I couldn't get enough of this scent!!!!!!!! I can't believe how I have come to use it even just on it's own without wearing any other perfumes on top to smell wonderful. I particularly like using it for my night beauty routine where I apply it all over my body, face, nail cuticles and a pea amount on my hair. I love that it isn't oily and sticky. It doesn't make my skin or hair greasy which is pretty amazing! After using it for a whole month I have noticed my skin being more radiant ,my hair and nails look longer and healthier than usual. If you think this particular scent is for you, you will definitely be swept of your feet with the Oriental Amber Argan Oil. The Oriental Amber Argan Oil comes a 50ml again beautifully bottled in the same luxurious manner. The bottle has a pipette for dropping the oil on your skin and I particularly like it as it gives it even more that authentic feel . This particular Argan Oil is infused with oriental amber scents. It has an enticing and addictive smell to it. I like to use it before going out as the smell is to die for. Every time I have tried a new Argan oil type from Formidable London I have loved the scent to it but this one is by far my favourite. It may be down to personal preference but I can't live without this particular one. You don't need perfume once you own one of their products. Again as per all their oils it's rich in anti-oxidants, fatty acids and Vitamin E. It is to be used on hair, nails and skin. It has the same exact benefits of their other oils. Wether you are in search of a new skin care , hair care or nail care regime, Formidable London has the perfect products for you. Forget Farsal Ali products which are basic and go for a luxury oil instead. You can even incorporate it in your makeup routine prior to applying your makeup. 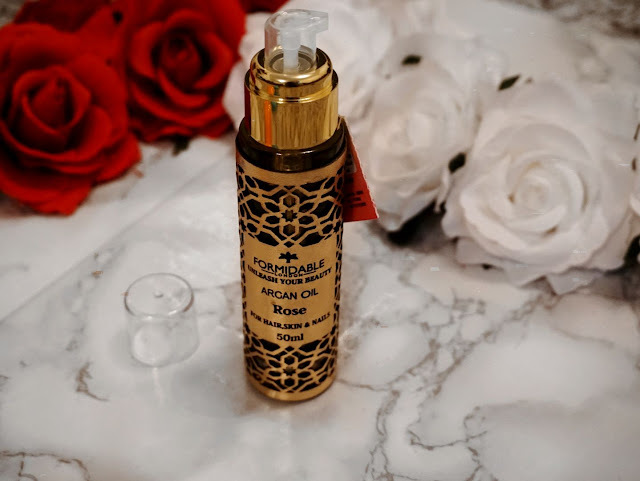 I currently use both the Rose Argan oil and Oriental Amber Argan Oil as part of my daily routine. I have noticed that my skin is supple and definitely glowing. I have never had hair or nails which are these long. 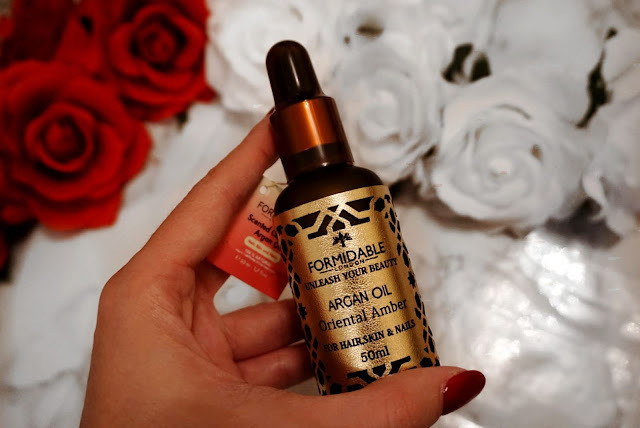 Formidable London not only do you provide the MOST EFFECTIVE Argan oil I have tried but these new scent variations are the best I have EVER used. I am surprised that the cost is so low considering the high quality of the product. This is a must have product if you are looking to raise your hair, nail and skin care.